it is expressing the fact that "the wind is blowing." On a hot summer's day, a wind bell hanging from the eaves facing the garden alerts people inside to the presence of the wind blowing. The person inside thinks, "Ah, the wind's blowing" (which contains the image of cooling off), and expecting a breeze to blow into the room momentarily, the skin's sensitivity unconsciously heightens slightly. The wind chime commands their senses and imagination to savor this information from the outside world. Some bells have a little slip of paper attached with a short wish or prayer (tansaku), which is send to the gods anytime the bell sounds – which can be quite often in a storm! See my Photo Album in a different window while you read this text about my favorite Daruma wind chimes. 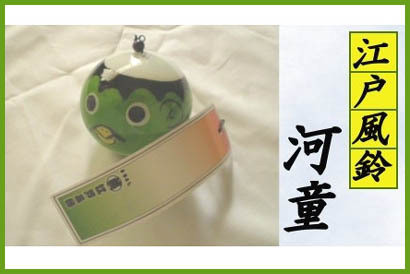 has a great collection of Daruma Wind Chimes for all purposes. You can order them online. The numbers are the pictures in my album. Unfortunately I can not quote the separate links of the Maruyoshi page, you have to click on the buttons on the left side of this index page. Here is a special one. 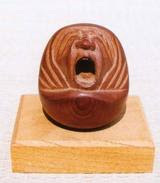 A wooden Daruma in Kokeshi-Tradition with a cast-iron bell in the Nambu-Tradition of Morioka, Northern Japan, as wind-chime. The Daruma chime of this temple is made of cast-iron. This is quite a famous festival in Kawasaki, about 1 hour south of Tokyo and one of the most famous temples in honor of Kooboo Daishi in the area. I will take this place up in its own story, since there are a lot of Daruma articles from there. Chimes hanging from some plant arrangement. The wind chime hangs from an arrangement for moss and flowers in various shapes, as you can see on this page. Hang them in a shaded place and spray with water, to enjoy the feel of cool. 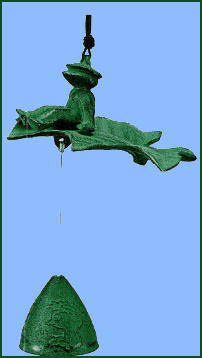 Iron Cricket Bell wind chime is the perfect addition to any home, garden, porch, etc. Hand cast in Japan from raw iron, its sturdy composition will last for years. The bell provides a pleasant and tranquil sound and will surely be a delight to everyone. Singing crickets have symbolism in Japanese culture, where they are symbols of autumn and they're the symbols of approaching winter and the death of life. The Japanese name for cricket is "suzumushi". 3. Design is an interface, not the creation of interfaces. 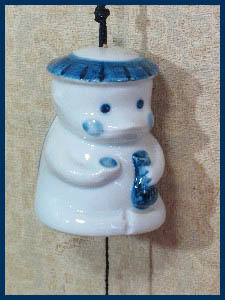 I'd like to show you a classic example---fuurin---which translates to "wind bell" in English. The interface design of this device is worth a moment's contemplation. The interest of the wind bell lies in the fact that it is not a musical instrument designed for the enjoyment of beautiful tone quality. 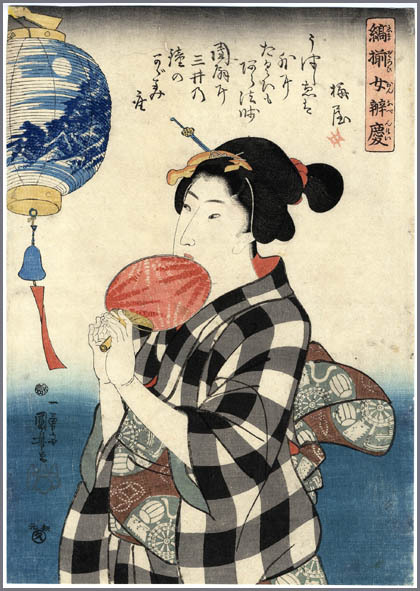 This tendency is particularly marked in the Japanese wind bell, which has less of a musical quality than wind chimes found in other cultures. The wind bell is not expressing sounds, it is expressing the fact that "the wind is blowing." On a hot summer's day, a wind bell hanging from the eaves facing the garden alerts people inside to the presence of the wind blowing. The person inside thinks, "Ah, the wind's blowing" (which contains the image of cooling off), and expecting a breeze to blow into the room momentarily, the skin's sensitivity unconsciously heightens slightly. The fuurin commands their senses and imagination to savor this information from the outside world. It is a perfect example of "synthetic Senseware." A Haiku Meeting with the subject of Wind Chimes and our Daruma is right with them ! The place is the Market at Kawasaki Daishi. are a representative traditional craft of Himeji. Originally these chimes were made from hibashi (metal chopsticks used to handle charcoal) that the Myochin family used while making armor. 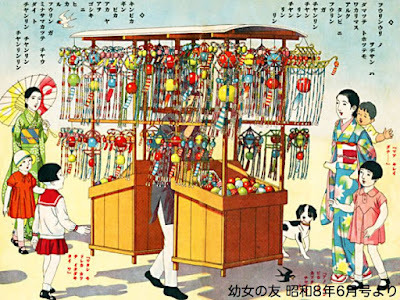 Afterwards, the demand for hibashi decreased and the 52nd head of the family, Munemichi Myochin, created a new type of wind chime. Clear sound and deep echoes are famous throughout Japan and musicians from inside and outside Japan, like Isao Tomita and Stevie Wonder, praise it. 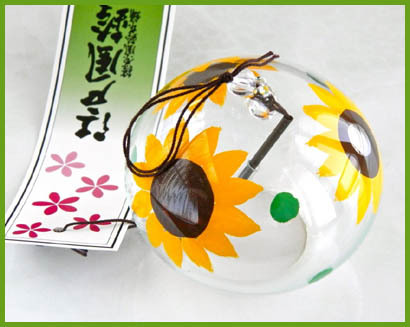 Japanese wind bells are called Furin; “Fu” is wind and “rin” is bell in Japanese. 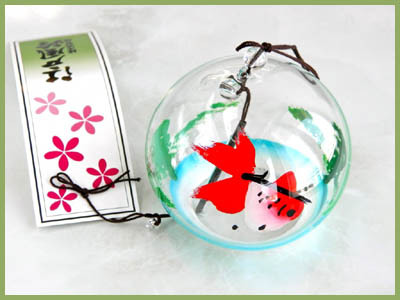 The glass Edo Furin wind bell is particularly beautiful and can be often seen during Japan’s humid summer. Wind chimes were originally a fortune-telling tool in China. The Chinese hung a bell in the bamboo forest and made predictions based on the wind’s direction and its sound. 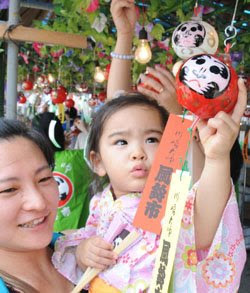 However, since they’ve arrived in Japan through Buddhism, Chinese wind-bells have been used to expel any lurking evil spirits. Japanese people believed that nothing unfortunate would happen to those who lived within earshot of a wind-bell. During the 12th to 17th century period, towns and villages suffered epidemics of the plague. Only noble and samurai families were able hang wind-bells under the corners of their roofs for protection, because they were made with phosphor bronze and were very expensive. In the 18th century, Dutch glass making techniques were introduced to Nagasaki, one of only four seaports kept open for trade during Japan’s seclusion period. It was the first time Japanese people ever saw glass. Thereafter, glass objects were shipped to the more affluent Osaka, Kyoto, and Edo (Tokyo) areas. People were instantly attracted to the beauty of glass, which prompted them to learn glass making for themselves. In the 19th century, someone came up with an idea for glass wind chimes. One of the characteristics of Edo wind chimes is that the glass painting is done from the inside in order to protect the colors. 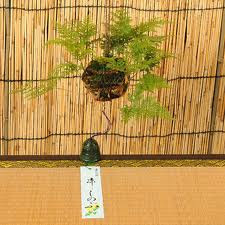 Japanese people find the sound of the wind chimes very refreshing, something that must be encoded in their DNA! The hot and humid Japanese summer is sometimes unbearable, but even a slight chime sound can send a signal to the brain saying “It’s cool!” This immediately causes the entire body to lower its body temperature (Or so some people think)! Edo glass wind chimes are perfect as Christmas ornaments and very popular in the West. Not only do the designs fit for the season, but the beautiful sound can also be quite merry, too! Great post! I have always been fascinated with wind chimes and my Japanese descent probably has something to do with that.